Eventually the family moved to the newly built council houses in Stambridge where she grew up, spent her childhood and from where she was married. All the family were married from there and Mrs Baker's parents continued to live in the same house for many years. 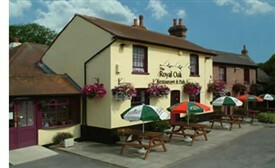 In those days there was a water pump and tank to the left of the square in front of the Royal Oak. The pump was used by Stambridge cottage households without running water and by passing gypsies who wanted to water their horses. Also, opposite the pub, there was a Baptist Chapel and a row of cottages nearby which are all now demolished. When she was a child Mrs Baker's father was employed to run a gang of workers on Purdy's brickfield (Sutton Road, Rochford) and her mother did casual field work on Rankin's farm to help make ends meet. 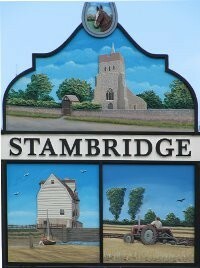 All the children went to Stambridge School and left at 14, the girls to go into service and the boys to work on the farm. Mrs Baker says, “I went into service at 14 and have done housework ever since!” Indeed, she was once, when well into her 80s, asked by a kindly doctor if she would like a home help. At the time Mrs Baker was still doing two regular housework jobs herself for other people! Most employment was more secure. At one time Mrs Baker was working for a lady who rented rooms above the solicitor's office in South Street, Rochford, when a young man who was lodging there asked if she knew anyone who could help his wife look after their young family. The young man was Dr Cole just moving to Essex to start his practice and this was the beginning of twenty years employment with the family for Mrs Baker. When Dr Cole went back to Scotland he suggested Mr and Mrs Baker should come and live there too but they would not consider leaving their family. She met her husband, Arthur, through her brothers when he came from Kent to work as a cowman on Rankin's Farm. When they were married in 1942 the couple moved into a tied cottage in Stambridge Road, Rochford and Mrs Baker still lives there 70 years later! At first the rent was four shillings (20p) a week plus one shilling (5p) for water. 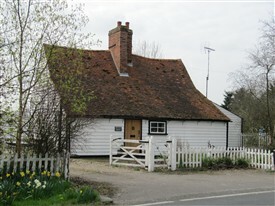 As Mr Baker was employed on the farm and the cottage was meant for a worker at Rankin's Mill, the rent was higher than usual. Arthur worked with horses and later on with tractors until his retirement at the age of 65. He prefered the horses, saying you could talk to a pair of horses but you couldn't talk to a tractor. Mrs Baker says market day was far better in the past when cattle and other animals were tied to a rail or penned in the square and hens and other poultry were kept behind the King's Head pub. When listening to this old lady talking about her long life spent within walking distance of her birth place over 95 years ago, you get the feeling that although times were often hard and there were few material goods to be had, people got pleasure from small things and the sense of family and community was strong. This page was added by Sue Horncastle on 03/06/2012. Brede House (or Bread House) was the property of the Canewdon Charity and the rental income was intended to provide bread for the poor. Hence the name! The Bread House land was purchased for the Canewdon charities, by the trustees and churchwardens Withers Jennings and Richard Edwards in 1715 for £70. The money used to purchase this had been bequeathed to the Canewdon Poor’s charity by Richard Woodes and had been raised through the sale of his estate at Scaldhurst, near Pudsey Hall Lane in 1688. The land is mentioned on the 1818 charities boards that are in the church and although the house is now privately owned the fields are still in part owned by the Canewdon charities to this day. A bill of sale from Queen Elizabeth’s time that was used back then to prove ownership has a large seal attached and survives in the Essex Records Office along with all the other Canewdon charity land documents. There is a framed photocopy of this document kept on the window ledge of one of the windows in the north aisle of Canewdon church.